Admitting, to yourself, that you have an anger management problem can be a difficult and timely issue. Yet once you are able to accept that you do have a problem you will be more open to seeking acceptance and resolution of this restrictive pattern of emotional expression. 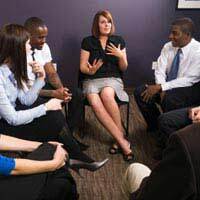 Joining an anger management support group will therefore enable you to explore additional methods, techniques and ways of improving your emotional response and expression, and may also help you achieve a better understanding of anger management. The suppression of anger and emotional feelings is a problem that many people experience on a daily basis. Many individuals may try to work through their emotional restrictions on their own, whilst others will continue to suppress emotional expression and anger in the hope that the feelings will simply disappear over time. Seeking the support of a supportive group, of understanding and accepting individuals, however, can greatly help reduce feelings of anxiety and frustration and increase awareness of the management of anger. Family members, friends and colleagues may already form part of a support group that encourages an individual’s anger management exploration. Seeking external support, from anger management counsellors or professionals and other individuals experiencing similar problems and difficulties, can often provide a better level of understanding. You are not alone in experiencing these emotional restrictions and meeting others who share your anger management concerns can be greatly beneficial in many ways. Anger management support groups provide a safe, supportive environment in which individuals are encouraged to freely express their emotional anxieties and frustrations. Talking about, and sharing, experiences and opinions helps individuals explore positive changes and emotional expression. Some groups provide a platform for shared response and encouragement, whilst other groups centre focus on an individual’s needs, which perhaps affect family relationships. Other groups provide support in a camp or retreat environment and accommodate different age groups and personal backgrounds. Workplace support groups can also provide a useful resource for understanding and exploring anger management. Supportive pastoral care is also offered in educational institutions and other organisations and can provide a good level of anger management care. Although there is no age limit to join a supportive anger management group there may be restrictions concerning objectives within individual groups. Objective will generally be age-related, as issues concerning children and young people may be very different from the emotional issues expressed by adults. When seeking support from a group it is therefore important to gather information regarding the group’s objectives before joining. The internet offers easy access to a wide variety of supportive networks and groups. Online support communities provide an important level of service to individuals who may not be able, or emotionally willing, to attend a support group in person. Participants will guide the flow of interaction and will provide a mutual support service that is beneficial to all of the community group members. Online support groups also provide a useful means of reducing an individual’s feelings of isolation and will help increase self-awareness and understanding of anger management issues.